With the season upon us, I thought I would do a special issue devoted to a Christmas song from the 80s. 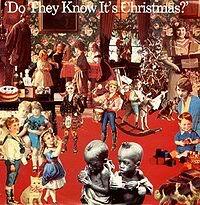 For this issue, I chose the song “Do They Know It’s Christmas” by Band Aid. This song was written by Bob Geldof (Boomtown Rats) and Midge Ure (Ultravox) in 1984 specifically to raise money for famine relief in Ethiopia. Geldof had a scheduled interview on a popular BBC radio station to promote his new album, but instead he selflessly used his airtime to publicize the idea for the charity single. By the time the musicians were recruited to record “Do They Know It’s Christmas” there was already intense media interest in the subject. Geldof put together a group which they called Band Aid, consisting of leading Irish and British musicians who were among the most popular and recognized of that era. What resulted was a literal who’s who of UK 80s musicians. Highlighting this impressive list were Paul Young, Boy George (Culture Club), George Michael (Wham! ), Duran Duran, Sting (The Police), Bono (U2), Phil Collins, Spandau Ballet, Bananarama and more. They recorded this iconic song on November 25, 1984. The only UK stars of that time who were obviously absent recorded messages that were used on the b-side of the album. Those artists include David Bowie, Annie Lennox (Eurythmics), Paul McCartney, Big Country and Holly Johnson (Frankie Goes to Hollywood). Even without these musicians, Geldof had recruited enough star power to make his song special. One thing to keep in mind is that this song preceded “We Are The World” which was a similar charity benefit song which was the American equivalent released in 1985. (Bono only) Well, tonight thank God it’s them instead of you. To me the lyrics are a bit pretentious, but I am willing to overlook that since the purpose of the song is well-meaning. The song would not have been nearly as powerful had these fantastic artists not lended their voices and talents to the cause. Still Geldof, Ure and all of Band Aid deserve a lot of credit for their selfless efforts and generosity. "I remember that David Bowie was going to get the first line, but Bob Geldof begs to differ! So who’s right? I’m not sure now. I do know that someone said I was all over it, and next time I listened to it I realized I was mixed pretty high all the way through. Wow… It was an honor and a pleasure though, and I’m chuffed I got the opening line." “Do They Know It’s Christmas” still ranks as the second best selling single in the UK with 3.8 million copies sold. It ranks ahead of Queen’s “Bohemian Rhapsody” (2.13 million) and now behind “Candle in the Wind 1997? (4.8 million). That is quite impressive for an impromptu Christmas song. It sold another 2.5 million copies in the U.S. and 11.7 million copies worldwide by 1989. It certainly inspired 1985's "We Are the World" which along with Live Aid that same year showed the social power of popular music. “Do They Know It’s Christmas” exemplifies the true meaning of Christmas as it promotes “peace on earth and goodwill to all.” The song not only raised much needed money for those less fortunate and in need, but maybe just as important, raised awareness to the issue which is still continues to be an issue even today. It is not the lighthearted and whimsical Christmas classic that most of us love, but it is an important part of pop culture in the 80’s and still receives airplay each and every holiday season. A great song for a great cause. Thanks for this nice breakdown of the song and the work and talent behind it.